If you are looking for an easy to prepare, yet a very delicate/elegant looking/delicious dessert, you are on the right page. 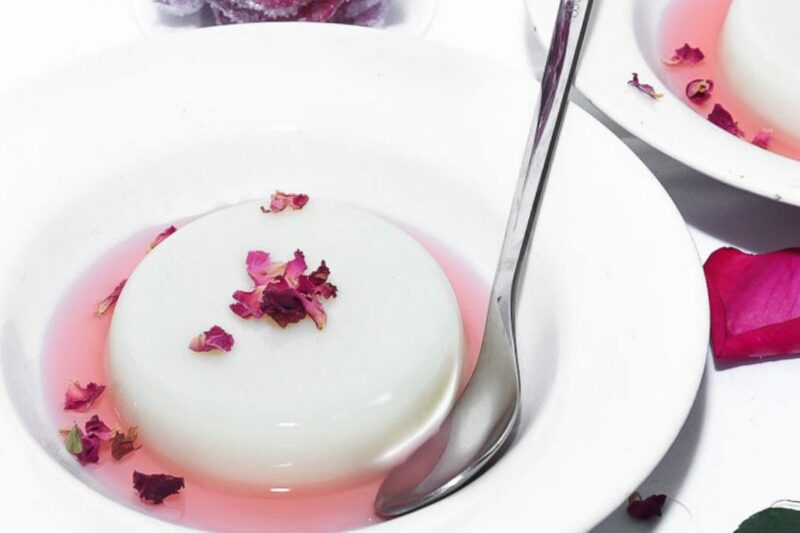 This White Chocolate Rose Panna Cotta is sure to showcase your kitchen talent. This recipe is from my list of easy valentine recipes. There is rose and white chocolate, which makes this dessert a perfect choice for anyone in love. I know, when it comes to fancy desserts, many of you doubt your kitchen skills. And also you would not want to spend hours in the kitchen to prepare a dessert to surprise your special him or her on the valentine day. Well! I have sorted out both these problems in this recipe here. Its a very quick to prepare dessert, just 15- 20 minutes of work time in the kitchen, and your fridge will take care of the rest of the work. 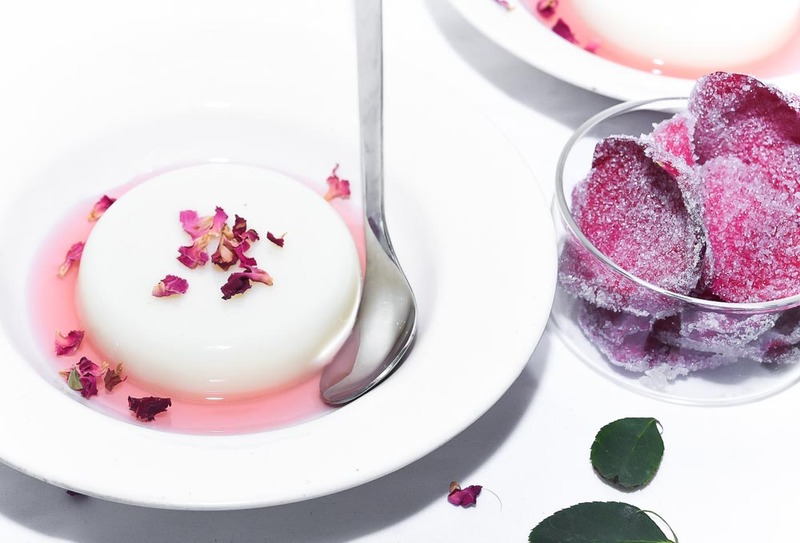 Once you prepare the pannacotta, it goes in the fridge to chill for 7-8 hours (or overnight). 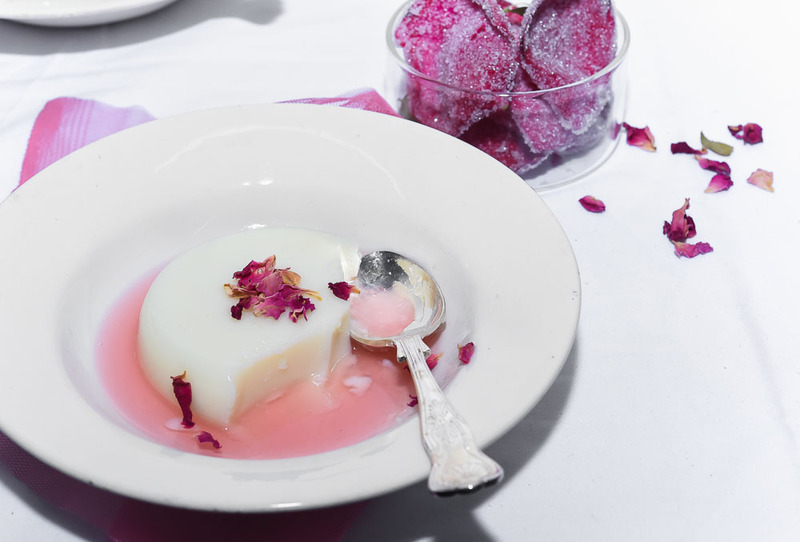 Plan and prepare pannacotta, a day before valentine this year and chill. If you have any doubts about your skillset in the kitchen, I assure you this is what you can surely achieve. It’s easy to understand follow, kind of recipe. I have also kept some do’s and don’ts of Panna Cotta making in the points below. Which will help you win this dessert… and win the heart too…. The word Panna Cotta literally means “cooked cream,”. So you can guess how creamy soft the end result should be. The jiggly, delicate, creamy texture is what you must achieve. 1. It is a very delicate balance of milk cream and gelatine. Where the creamy, yummy mix is delicately holding up the shape with the right amount of gelatine. It quivers when touched. Too much gelatine will make it stiff and cheesy. Too little and it will puddle on the plate when you unmold it. So be careful about the accurate measurement of the ingredients. The basic ratio to achieve that right texture is – 2 ½ cups of cream (sweetened) and 1 ½ cups of whole milk, plus 5 tablespoons of sugar, set with 1 tablespoon of gelatin. Please follow this ratio, no matter what flavour you are adding to the pannacotta. 2. 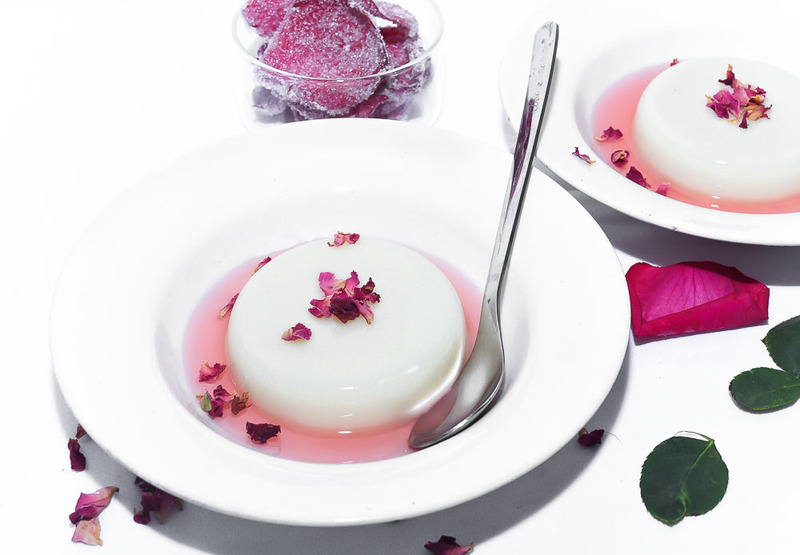 Choose unflavored gelatin for making pannacotta. Make sure to “bloom” it before adding it to your cream mixture. Blooming gelatin basically means you’re dissolving it and allowing it to absorb liquid (room temperature). The blooming process is pretty easy — just sprinkle the gelatin over water or milk. Give it a gentle stir to make sure an even distribution, and let it sit for a few minutes (usually about 5 minutes will do the trick). 3. Add the softened/bloomed gelatin to the hot cream and milk mixture and whisk all until smooth. Make sure the mixture is completely smooth and that there are no little crystals remaining. If there are, bring the saucepan back to the stove and heat very gently without letting the mixture boil (this is very important!) until the gelatin is completely dissolved. Avoid heating the mix on the high flame, once you have mixed in gelatine. Stir and stir and stir to mix it all. 4. Now it is a dessert and I, unfortunately, can’t give you a healthier version. 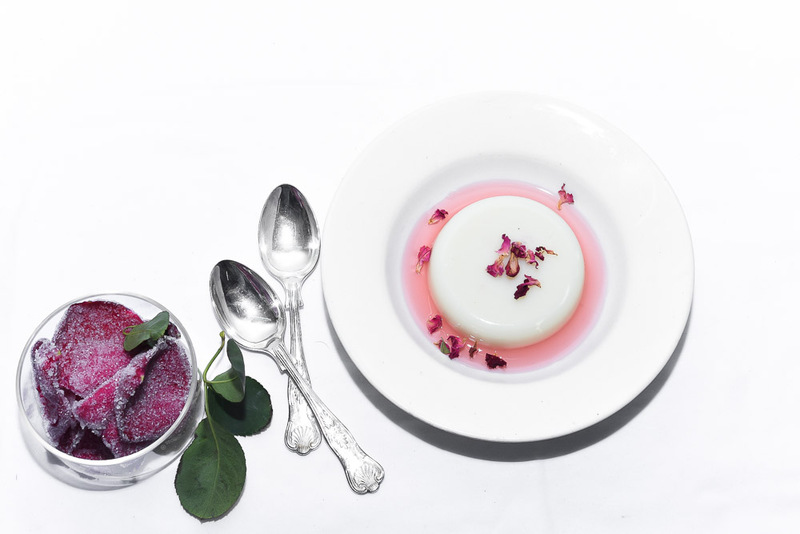 Don’t even try making this pannacotta with low-fat milk or less sugar. Enjoy it to the fullest and go for a run in the morning. 5. Yes, I can give an alternative to gelatine. Because many don’t consume gelatine. Use agar-agar powder instead of gelatine. But panna cotta won’t be as jiggly as the one that’s cooked with gelatine. Agar-Agar derived from cooked and pressed seaweed, is available flaked, powdered, or in bars. I suggest please use powder agar powder. Substitute powdered agar-agar for gelatin using equal amounts in this recipe. How to add Agar – Agar instead of gelatine – Urban Platter Agar Powder, 150g If you choose to use agar powder (instead of gelatine) add it to the milk and cream mix and mix until it is well combined. Let it rest for 15 minutes before you start the flame. After about 15 minutes of rest time, heat on a medium flame until agar powder dissolves completely. After the mix starts to boil, lower the flame and cook for another 5 minutes. (Mixing constantly). Use a fine mesh to filter the mixture into a clean bowl. And add the flavouring. Tip – Keep in mind that highly acidic ingredients, such as lemons, strawberries, oranges, and other citrus fruits, may require more agar-agar than the recipe calls for. Also, enzymes in fresh mangoes, papaya, and pineapple break down the gelling ability of the agar-agar so that it will not set. Cooking these fruits before adding them to a recipe, however, neutralizes the enzymes so that the agar-agar can set. 6. I have used rose and white chocolate for flavouring my Panna Cotta. We will add chopped White Chocolate to the milk and cream mix, and heat it so it melts/combines well. Make sure to use a good quality white chocolate. 7. For the flavour, I have used Ossoro RoseOs …. 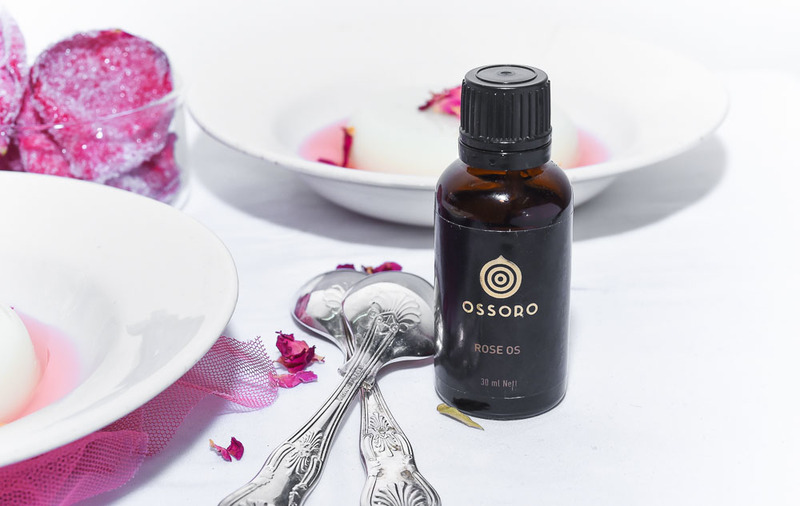 Ossoro Rose OS, 30ml, Oil Soluble Essence for Confectionery, Baking Its a bottle packed with beautiful rose aroma. Few drops added a lot of depth to my Panna Cotta. Make sure to add the rose flavour at the end of the cooling process, before setting in the moulds. Simply stir to mix well. 8. Once the pannacotta is set well and you are ready to serve. You will be really excited to see the texture and beauty. But have a tiny bit of more patience to achieve that wow … as it holds a super delicate shape. How to de-mould – Run a thin blade knife around the edge of the cup (which holds your pannacotta) to release from the sides. OR Dip each mould for just a few seconds into a shallow container of hot water before turning out. 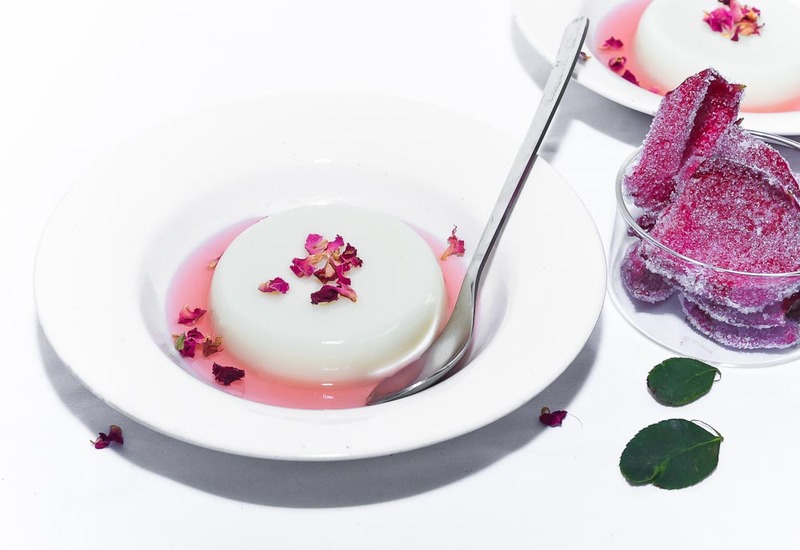 And de-mould in a fantastic looking plate — As if you are cooking and presenting a Pannacotta in Masterchef Australia … enjoy the process… You have to have a wow factor in this Valentine dessert. 9. 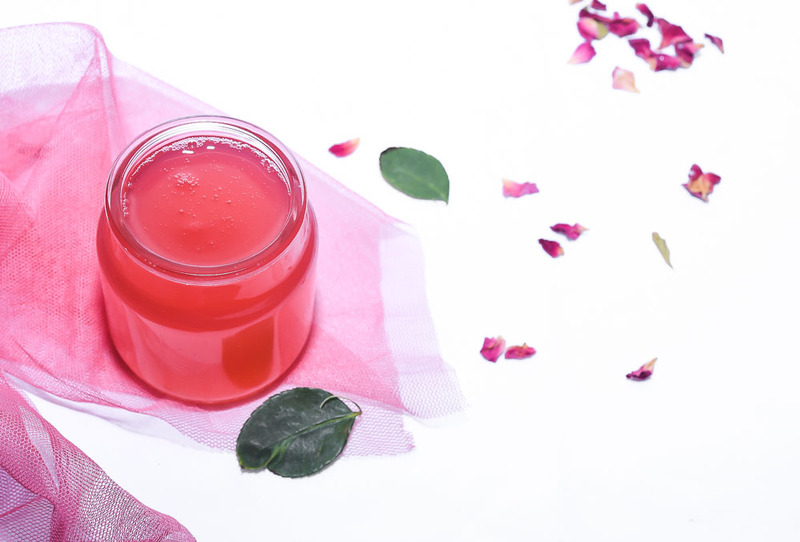 For the Rose Syrup – 1/2 cup water, 1/2 cup sugar, juice from 1 lemon and 1 cup of rose petals. 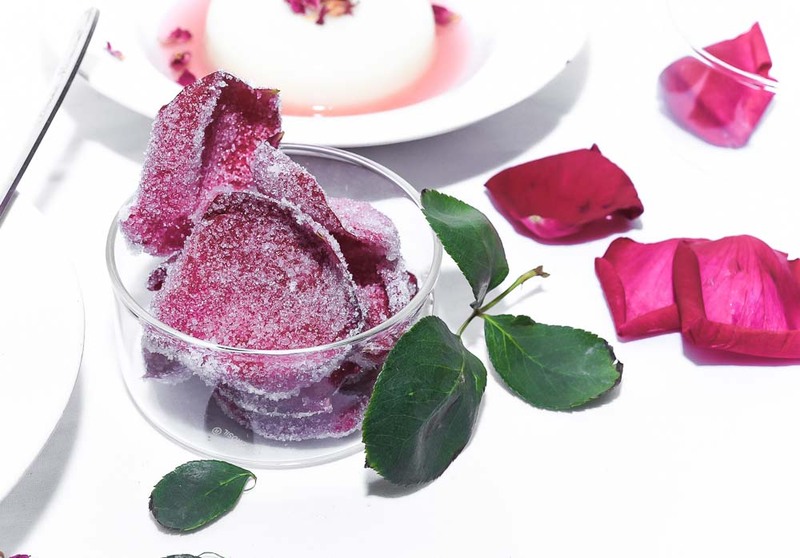 On a medium flame cook together sugar, water and lemon juice and as it starts to boil add the rose petals. Take the petals out as it leeks out the colour and don’t overcook the petals. Or they sometimes can give slight bitter after taste. Strain through a muslin cloth and add few drops of Ossoro Rose flavour. Let the syrup cool and store in a bottle in the fridge. Place cream, chocolate, milk and caster sugar in a saucepan over low heat. Cook, stirring, for 3-4 minutes or until chocolate melts and the mixture is smooth. 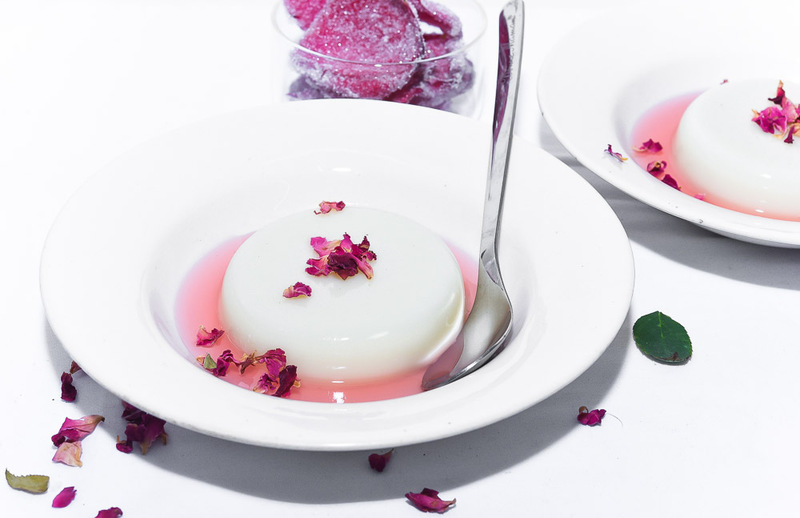 Bloom gelatine with 2 tablespoons of milk. Sprinkle gelatine on the milk, mix gently and let it sit for 5 minutes. Add bloomed gelatine to the hot milk-cream mix and whisk with a fork to remove any lumps. Stir until gelatine dissolves completely. Add a few drops of Ossoro Rose flavour and mix. Pour in dariole moulds or cups. Let it cool at the room temperature. Cover with plastic wrap and place in the fridge for 6 -7 hours to set. De-mould the prepared pannacotta (see the notes above) place carefully on a plate. Pour some chilled rose syrup and sprinkle some dried rose petals and enjoy with the one you love the most on valentines day.